Myspace's Facebook 'Mashup' -- Why Bother? MySpace has opened up its new-look website to the wider public after more than six months of internal beta testing and limited previews. 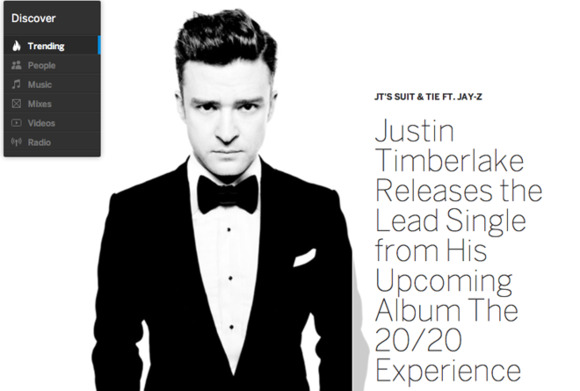 The launch coincides with the release of Justin Timberlake’s new single, “Suit & Tie,” featuring rapper Jay-Z, which is promoted on the landing page of the site. Timberlake is one of the main investors in MySpace. He teamed up with Specific Media to purchase the site for about $35 million from News Corp. in 2011. News Corp. had purchased MySpace in 2005 for $580 million. Anyone can now sign up to the new MySpace, with their Facebook or Twitter account, or with an old MySpace account, if you ever had one. 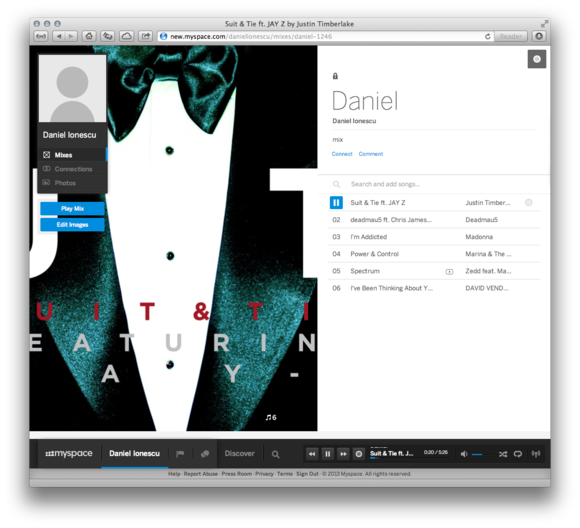 The new-look MySpace seems inspired by the Windows 8 Metro user interface, with clean rectangles, straight lines and smooth scrolling. The central point of the new MySpace is music. The bottom of the page is dedicated to the audio deck, where you can create your own mix (playlist) or listen to radio stations based on your musical tastes. The Radio feature is similar to Last.fm, where you pick one song to start with and MySpace will play song recommendations based on that choice. You can also listen to other people’s mixes and share your own. Some songs also have music videos available to play straight from your mix, and you can play them in full screen or in a corner of the page while browsing. You won’t find a typical Facebook news feed with the new MySpace. Instead, you can update your status by scrolling right on the main page, where you will find your friends’ updates. To add new friends, go to the People tab from the top left, and you “connect” with artists or people you know. Meanwhile, the Discover tab is the place where the new MySpace highlights videos, news, photos and updates from popular artists and MySpace staffers. With such a clear focus on music, MySpace seems to lack the social aspect of Facebook, where your friends’ updates are the central point. That’s probably because not many people are yet on the new MySpace. However, what you might find MySpace useful for is for its wide access to music collections. From a few initial searches, I was able to find plenty of popular songs and add them to a mix. From there, I was able to listen for free and without any commercials to all the songs I wanted to — think of it for now as a more social Spotify, where you can get updates direct from artists and your friends, without the monthly subscription fee.